It’s difficult to mask the clinical nature of exam rooms, even in the cheeriest of pediatrician’s offices. But a doctor’s simple gesture of handing out a storybook at every visit can make a big difference in keeping a child comfortable while providing a window into that child’s development. During the last two decades, Reach Out and Read of Northwest Ohio — a grant-funded program of The University of Toledo Department of Pediatrics — has provided more than 258,000 books to children across the region from birth to age 5. 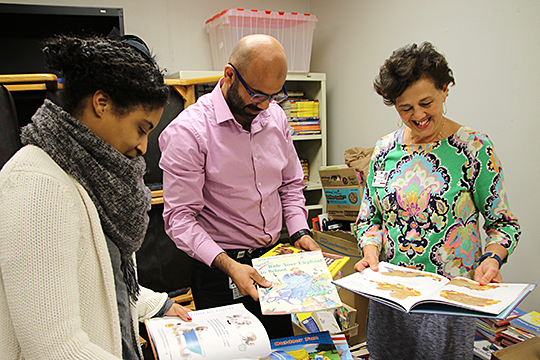 Dr. DeAnna McGarity, first-year resident in UT Pediatrics, left, Dr. Rami Abdel Aziz, first-year resident in UT Pediatrics, and Lori LeGendre, Reach Out and Read program director, looked at some of the books collected during the drive. Books and donations will be accepted through Thursday, Nov. 15. In honor of the initiative’s 20th anniversary, the group is in the midst of a book drive with a goal of collecting 20,000 children’s books. Reach Out and Read is an evidence-based medical model using literacy guidance as a stepping-stone to school readiness and to enhance parent-child relationships. It also serves as a literacy program, modeling the importance of reading to parents, and as a tool for pediatricians. Currently, the program is at 25 sites across the region, including the Rocket Pediatrics locations in Waterville and at the Ruppert Health Center on UT’s Health Science Campus. Reach Out and Read of Northwest Ohio serves about 14,000 children, handing out about 28,000 books a year. In some cases, the books families receive through Reach Out and Read are the only books in the home, LeGendre said. Nationally, more than 32,000 doctors and nurses across all 50 states participate in the program, reaching 4.7 million children annually. Monetary donations to the Reach Out and Read of Northwest Ohio book drive can be made by visiting Books by the Bushel. The program also is accepting donations of new and gently used books. The book drive runs through Thursday, Nov. 15. For more information, contact LeGendre at 419.291.0038 or lori.legendre@utoledo.edu. This entry was posted on Tuesday, November 6th, 2018 at 3:34 am and is filed under Events, News, UTMC, UToday .